No one wants the kitten video they’re watching on Youtube to stop and reload endlessly. 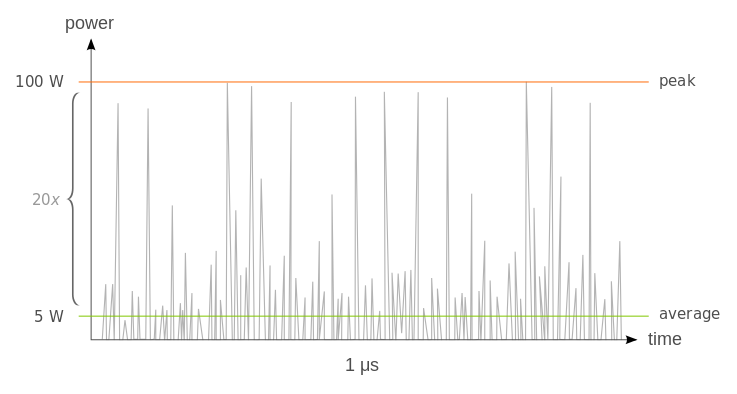 We all want to send big chunks of data very fast, while still keeping the integrity of said data. Nevertheless, the faster you send data, the more likely it is to experience transmission problems, especially due to interference or weak signal. OFDM (Orthogonal Frequency Division Multiplexing) is the radio science behind huge bandwidth capabilities we see in LTE. OFDM splits data into small sub-carriers, also known as data streams, on neighboring frequencies, over a single channel. It allows sending more data than through single carrier modulation techniques, and at a higher rate. OFDM also handles phenomena such as interference, noise or multipath significantly more efficiently than other modulation methods. The following explanation is for non-engineers and is meant to shed some light on OFDM, so keep in mind that we are leaving out many details that are not critical for understanding what OFDM is or why we use it. We’ll use a theoretical example: a bandwidth of 1 MHz and round numbers, which are easier to remember and apply to real-life scenarios. 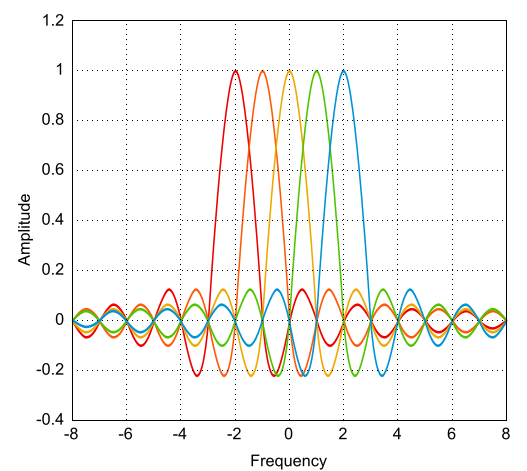 Traditional single carrier modulation uses only one frequency to send the bits, as seen below. In OFDM, the bandwidth of 1 MHz band is split into, say, 1000 sub-carriers of 1 kHz, and each of them sends one symbol per millisecond. Next, OFDM uses the FFT (fast Fourier transform) algorithm and its inverse to effectively retrieve the original data bits from the symbols and vice versa. Last, but not least, OFDM has a special property called orthogonality, which essentially means that sub-carriers are spaced in such a way that they only partially overlap, as the peak of each sub-carrier intersects the zero crossing of the neighboring sub-carrier. 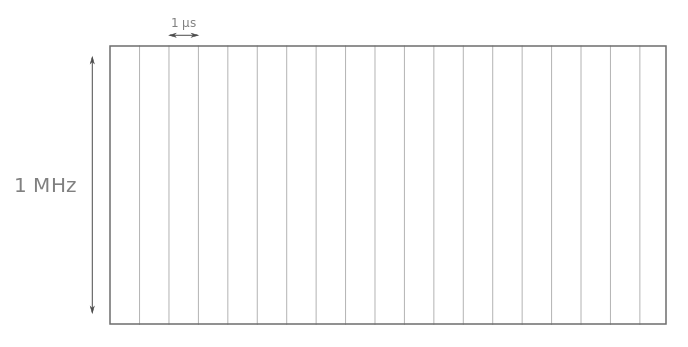 This characteristic is perfectly illustrated in the image below, where you can see 5 of the 1000 1 kHz sub-carriers in the frequency domain, in a single channel. Orthogonality is what allows us to pack sub-carriers really tight, without wasted frequencies between them as in traditional cases, which require using guard bands. Let’s go back to the example used earlier. The data rate obtained using OFDM is the same as in the case of single-carrier modulation, so you might wonder why we use it so enthusiastically in LTE, which is what we’ll explain below. Multipath propagation occurs the moment a radio signal bounces-off obstacles that appear in its path: water sources, hills and mountains, buildings, trees etc. Multipath causes the transmitted signal to be sent on two or more paths to the receiver, making it difficult for the receiver to interpret what it receives. Only some frequencies are prone to experience multipath. In single carrier modulation systems, it has a damaging impact throughout the whole frequency and affects all of the data symbols. 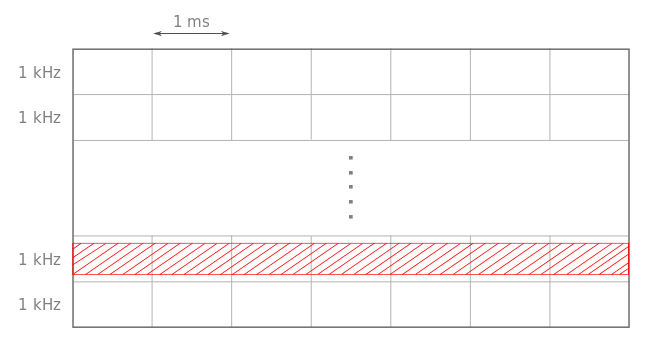 Take a look at the image below: only one carrier experiences multipath, but since all sub-carriers transport redundant copies of the sent symbols, data loss is minimal. OFDM is also effective against interference because only some of the data streams will be affected by this phenomenon and data can be more easily recovered with redundant error-correction coding. When using OFDM, LTE can tailor the modulation to make the best possible use of the available radio path to and from the UEs. Because of the OFDM carrier structure, LTE can take advantage of the changes in channel conditions and uses different modulations depending how close or far the UEs are from the transmitter. Because it uses OFMD, LTE can dynamically change the symbol alphabet, depending on the radio conditions, for each individual sub-carrier. For example, if you’re sending data close to the transmitter, LTE will apply a 64-QAM modulation scheme, that is 6 bits/symbol. But if you are moving further from the transmitter, and the radio conditions are unreliable, LTE will dynamically adapt to either 16-QAM or QPSK, sending 4 or 2 bits/symbol. In extreme cases, LTE can even use BPSK (1 bit/symbol). OFDM also has its downsides. OFDM has a high peak-to-average power ratio, and requires a highly linear and oversized power amplifier that usually has a low efficiency. 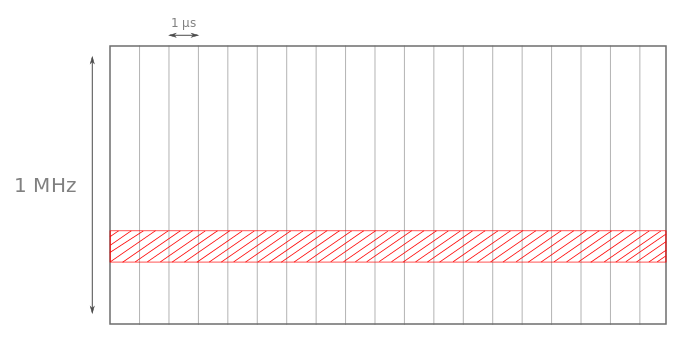 In the image below, you can see a typical OFDM peak-to-average power ratio. 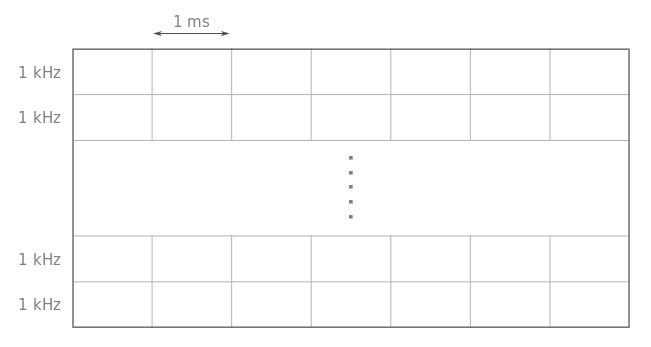 This occurs because multiple sub-carriers with different phases combine constructively in the time domain. Typically, to obtain a 5 W average output power, an OFDM system requires a 100 W power amplifier, representing an increase by a factor of 20 from the actual 5 W output. Otherwise, the distortion is far too destructive to allow OFDM to function normally. OFDM is also very sensitive to Doppler shift. This phenomenon occurs when the UE is moving, thus making the frequency of the signal received different from the frequency of the initially transmitted signal. Among its effects in OFDM, Doppler shift deteriorates synchronization, data recovery, and destroys the orthogonality of sub-carriers. This entry was posted in LTE, OFDM. Bookmark the permalink.